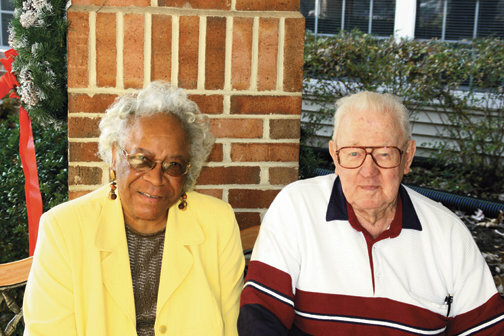 Freeda Johnson and Colonel Donald Evans, Jr. may not have taken the same roads in life, but it was a similar one that led them to Sommerset, an independent living community in Sterling, Va. Although the former school teacher and decorated soldier relocated to their new home in order to be closer to their families, both have been pleasantly surprised to have found a tight-knit extended family with their fellow residents and staff. Freeda hails from Spartanburg, S.C., where a street is actually named after her husband, Reverend C.M. Johnson. For 34 years, she taught French and worked as a high school guidance counselor. When Freeda’s husband and sister passed away, her daughter helped research living options near her home in Arlington, Va. Especially important for Freeda was being able to keep her king-sized bed. “We looked everywhere,” she said. Sommerset, however, seemed to perfectly accommodate not only Freeda’s bed, but her lifestyle. Since making the move, she has loved participating in the community’s activities and outings while establishing numerous friendships. “We have fun,” she said with a smile. And she can be seen particularly having fun playing games, from Bingo to cards. “I never miss my turn,” she said. Diagnosed with diabetes, Freeda has also been focused on a walking program where she strolls with her friends every day at 7 a.m. and enjoys breakfast after. Colonel Donald Evans, Jr. USMC Retired is known as Don around Sommerset. Born and raised in Altoona, Pa., he started his nearly four-decade career with the Marines in 1943. When he enrolled at Colgate University, he met Phyllis, his wife of over 57 years. The couple raised three sons while living all over the world as Don served in the Korean and Vietnam Wars and had several assignments in China. He had eventually been assigned to HQMC in Quantico, Va. when he retired in 1977. Don summed up the couple’s retirement with one word: “golf.” They each played on golf teams at Fort Belvoir for over 30 years and also participated in bowling leagues. Although they lived in a beautiful home in Mt. Vernon, they wanted to be closer to their family, which had since grown with seven grandchildren. With their loved ones living in Herndon and Purcellville, they chose Sommerset. Shortly after making the move, however, Phyllis developed some health problems. Deciding he did not want to hire outside help, Don said, “I wanted to be the nurse.” He proudly dedicated all of his time and effort during that first year to take care of her. “She was a wonderful woman,” he said. After Phyllis passed away, he knew he wanted to stay at Sommerset. “I didn’t want to leave. I like the people here and they are very interesting,” he said. Sommerset Retirement Community in Sterling, Virginia Loudoun County has the best activities and social gatherings for their Residents. Thank you, Paula! Our activities and social programs are loved and highly reccommended by our Residents and their family members. Ever since my mother has moved to Sommerset Retirement Community in Sterling, Virginia I have never seen her so active! She loves it there. Thank you to all the staff for making miracles happen.